A 1973 graduate of Eisenhower High School and his wife are the photographers showcased this month in the gallery of the Wichita Mountains Wildlife Refuge Visitor Center. Barbara and Jerry Cornelius now run Canyon Creek Art, a custom frame shop in the Dallas suburb of Richardson, Texas. They have a Giclee large format digital printer capable of printing customers’ photos on either canvas or fine art paper. For the 25 color photos in the show, all but two of which were shot in the refuge, the couple offer a variety of not only photos but also framing and displaying techniques. Some are printed on photo paper, matted and framed the traditional way. Others are printed on canvas using what’s called a “gallery wrap,” where the image extends around the edges of the stretched canvas and the image is displayed unframed. Jerrry Cornelius said each picture has its own personality and for each one he used a framing technique that lends itself to the individual image. Every picture in the show was shot with a Canon Rebel digital camera, but some of it is strictly photography while some is photography mixed with digital graphics. Some photos in the show are award winning pieces from various photo contests. “We just tried to make a good representation between landscapes and the animals that are there. It’s about a 50/50 mix,” Jerry Cornelius said. The couple still visit this area about three or four times a year, so certain images in the show were taken as long as seven or eight years ago, while others were shot as recently as last fall. A lot of it is sentiment because Jerry grew up here. “We love to hike and see the animals. We go to Meers for the hamburgers. Gotta do that,” he said. They do the majority of their hiking in the Charon’s Gardens Wilderness Area. The area around Quanah Parker Lake is where they take most of their photographs. Jerry generally gets up before sunrise to get early-morning images while Barbara waits until later in the day. Most of their shots of Mount Scott were taken in the evening. Jerry, the son of Jean and Lee Cornelius grew up in Lawton, and his father was a major stationed at Fort Sill. While in high school here, Jerry was in the first class that went through the newly opened Great Plains Vocational Technical Center, now called Great Plains Technology Center. He studied food service there, and learned his framing trade while attending a community college in Dallas. He has done custom framing and photography exclusively for over 35 years. For part of that time, he returned to Lawton and worked with Jack Gibson for three years at The Frame Shop, the precursor to Wright’s Frame Shop. Barbara and Jerry have made their home in Richardson for 25 years. Canyon Creek Art is located at 5021 Central Expressway, Suite 101, Richardson, Texas 75080. The phone number is 972-690-6216. The Refuge Visitor Center is open daily from 9 a.m. to 5 p.m. at the juncture of Oklahoma 49 and Oklahoma 115. Barbara photographed this majestic American Buffalo while he roamed among the expansive pastures where native grasses sway in the breeze. 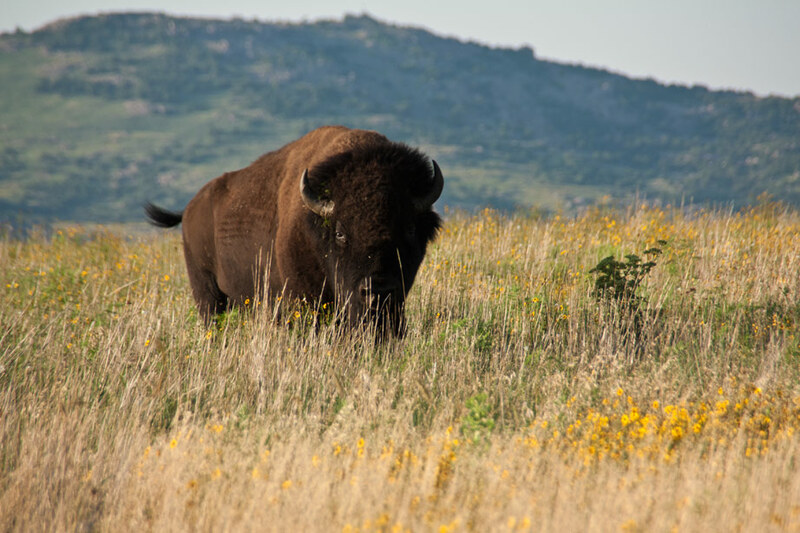 At six feet tall and weighing about 1,000 pounds, he cuts a striking figure with thick brown fur contrasting against the wonder of the Wichita Mountains. “Buffalo Morning” by Barbara Cornelius of Canyon Creek Art, Richardson,Texas, is one of the photos that can be seen this month in the new exhibit at the Wichita Mountains Wildlife Refuge Visitor Center.